Now you devoted Apple device toters can easily subscribe using your favorite podcasting app of choice! 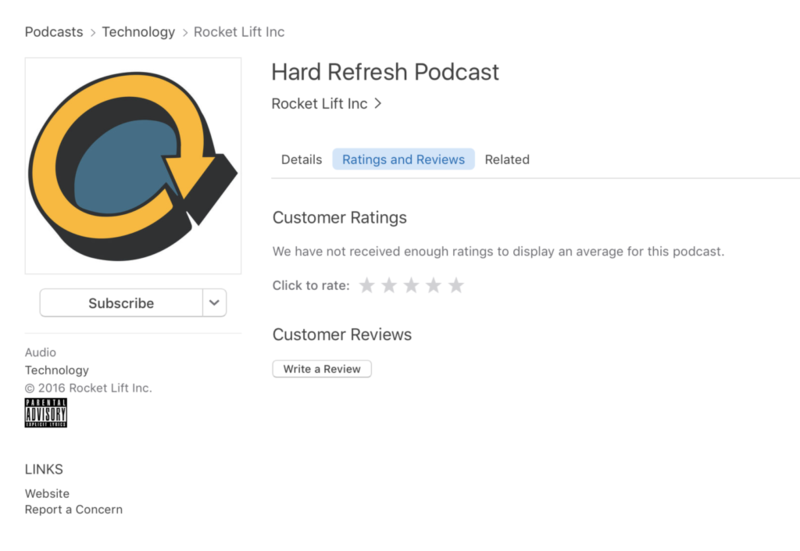 This comes one week after the launch of HardRefresh.audio, where you can also download, listen, and manually subscribe using RSS if you prefer. Why wait? Subscribe through iTunes here, and be sure you don’t miss the next episode! For fans of the show reading this, we have a big favor to ask: Would you leave us a five star review? Open iTunes and go to our show page. This magical link should take take you directly there, but if it doesn’t, just search for “Hard Refresh”. Click the “Ratings and Reviews” tab. Under “Customer Reviews”, click the “Write a Review” button. You got it from here.